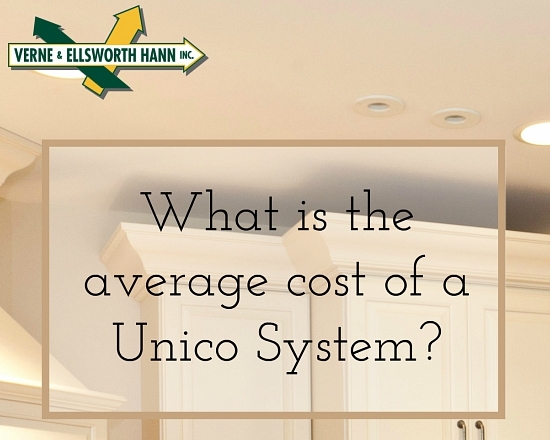 What is the average cost of a Unico System? The Unico System is a high-efficient cooling system that can be discreetly retrofitted into vintage homes or designed into new construction without the need for extensive remodeling. Flexible supply tubing is fitted into existing wall cavities, ceilings or floors. Modular air handlers – small enough to fit into closets, attics and crawl spaces – are powerful enough to effectively circulate air throughout your home. The Unico System is whisper quiet, draft-free and provides even temperatures. The price of a Unico cooling system can vary. One obvious factor would be the size of your home, but with a Unico, the most important factor that affects the cost is the complexity of the job. Installation in an attic would be less difficult than installation in a finished third floor. The accessible space plays a big roll in figuring the cost, but the average is $20,000. Verne & Ellsworth Hann, located in Cleveland Heights, has been installing Unico Systems for years. Many homes in Cleveland Heights, Shaker Heights, University Heights, and much of the surrounding area are heated with boilers. Verne & Ellsworth Hann specializes in steam and hot water boilers so the Unico System is a great addition to these homes for air conditioning. If you are interested in adding the Unico System to your home, call Verne & Ellsworth Hann at 216-932-9755. 4th generation co-owners, Bill or Chris Hann, can engineer the layout of the system and calculate what would be needed to efficiently cool your home.